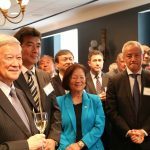 Sasakawa USA co-hosted a reception celebrating the U.S.-Japan relationship for Japanese Diet Members visiting Washington, D.C. during Japan’s Golden Week holiday. The reception, which took place on Capitol Hill, included Diet Members visiting for sponsored events, as well as Members traveling independently. 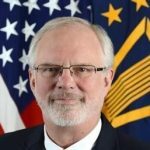 Sasakawa USA celebrated the importance of the U.S.-Japan relationship with a Congressional Reception at the Reserve Officers Association Building. 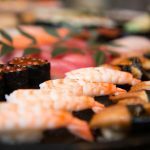 This reception provided attendees with the opportunity to learn more about the U.S.-Japan relationship while enjoying Japanese cuisine and drinks. 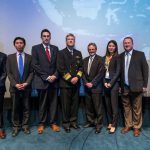 Sasakawa USA partnered with the National Bureau of Asian Research for an important Capitol Hill briefing on maritime issues. This event featured a demonstration of the Maritime Awareness Project. 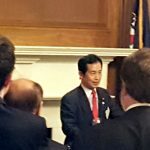 Sasakawa USA hosted its second annual “Evening with Japan Experts” event on Capitol Hill. This intimate gathering of leading experts and key Congressional staff celebrated the previous year of the U.S.-Japan alliance and discussed the challenges ahead. 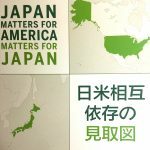 Sasakawa USA and the East-West Center of Washington, D.C., co-hosted the release of “Japan Matters for America” — a publication that quantifies the impact of the U.S.-Japan Alliance through economic and social data. 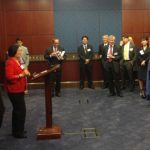 On October 21,2015, Sasakawa USA hosted an event on Capitol Hill as a follow up to our conference on March 25, 2015 on U.S.-Japan cooperation in Myanmar. 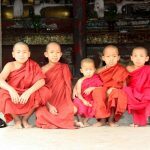 With Myanmar’s elections looming on the horizon, this timely discussion will focused on ways that the U.S. and Japan can work together to assist in Myanmar’s democratic transition, including on-the-ground efforts in capacity building. In addition to the discussions, Sasakawa USA released a report detailing its findings and recommendations for cooperation in this field. On October 22, Sasakawa USA, in partnership with the Congressional Study Group on Japan and in cooperation with the U.S.-Japan Caucus, hosted a briefing for members of Congress and their staff to discuss the implications of Japan’s new security legislation. Sasakawa USA hosted a Congressional staff briefing on the Asian Infrastructure Investment Bank (AIIB). 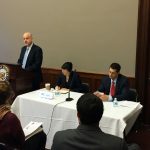 The panelists, including Mr. Masahiro Kawai, Ms. Yun Sun, and Mr. Tobias Harris, presented the U.S., Japanese and Chinese perspectives of the creation, development and future of the AIIB and highlighted important points for Congressional consideration. On April 30, 2015, Sasakawa USA joined the Maureen and Mike Mansfield Foundation, Japan Center for International Exchange, U.S.-Japan Conference on Cultural and Educational Interchange, Japan-U.S. 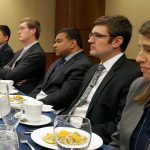 Friendship Commission, U.S.-Japan-South Korea Legislative Exchange Program, U.S.-Japan Council and the Congressional Study Group on Japan in hosting a reception on Capitol Hill for visiting Japanese Diet members.